I started my previous post by mentioning Amara Geffen's background as an artist and art teacher. So let me give you one striking example of the role art -- as worked on by Allegheny College students -- plays in Meadville, Pennsylvania. And it truly is striking, because as you enter the city on U.S. 6/322 you see 1200 feet of recycled road signs lining the side of the highway. But you wouldn't know they were recycled road signs unless you got out of your car (which, Geffen told me, several visitors do every day) and took a closer look. 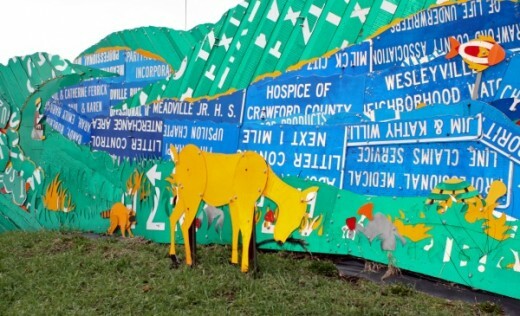 Over the course of several years, this wonderful work of art -- known informally as "The Fence"-- has been growing along the main gateway into Meadville. For a complete scrollable view of The Fence (officially called, "Read Between the Signs") and more on its history. Putting it together has involved not just Allegheny students but local high school students as well. Penn DOT has also been an enthusiastic partner in this project, even helping out with some of the welding. The art serves not just to highlight different features of Meadville, but to hide from view Penn DOT's maintenance facility, which used to be set off by an unattractive 6 foot high chain link fence. 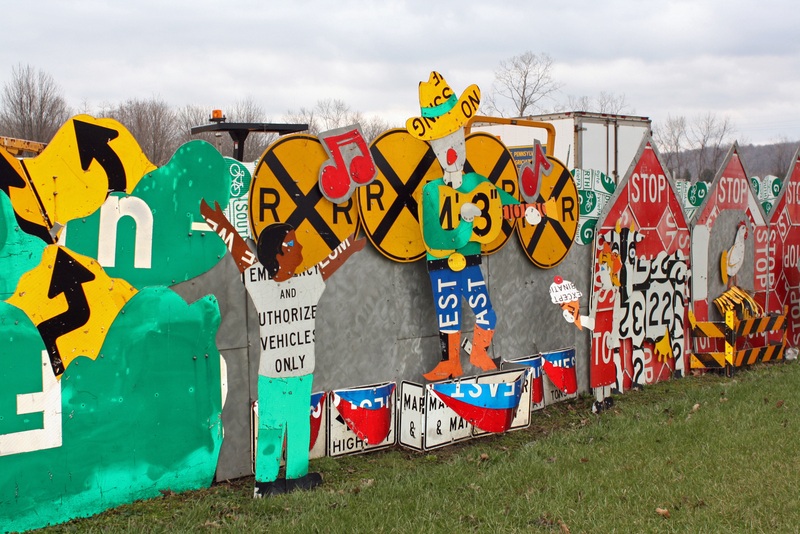 For those of you who might want to visit Meadville and see this amazing work of recycled art, it's just opposite the intersection listed below. Zoom in for better visibility. You can see the Penn DOT maintenance yard just above the pointer when you zoom in -- that's what "the Fence" hides from ground-level view. Art, college, community. There's much to learn from Allegheny College and Meadville.